You are currently browsing the Dr Licciardi blog archives for October, 2010. Today we are going to finish discussing the difference between the HSG and saline sonogram. Last time we highlighted the differences as they relate to studying uterine problems. Today I will point out the differences as they relate to the tubes. We will see how the biggest mistake doctors make with the saline sonogram is when they see no fluid from the tubes and stubbornly say that the tubes must be blocked, therefore you need IVF. Let me explain. The saline sonogram is not the best test to check the tubes. It gives a hint as to the tubal status, but the results are not definitive enough. Last blog we discussed one of the basic concepts of the saline sonogram: water looks black on ultrasound, polyps and fibroids look white. We put water inside the uterus and the white polyps or fibroids float in the black fluid making them easy to see. During a saline sonogram, the saline, after it fills up the uterus, will wander through the tubes and out into the pelvis. So it makes sense that if we can see some black fluid outside the uterus, around the ovaries and intestines, the tubes must be open. 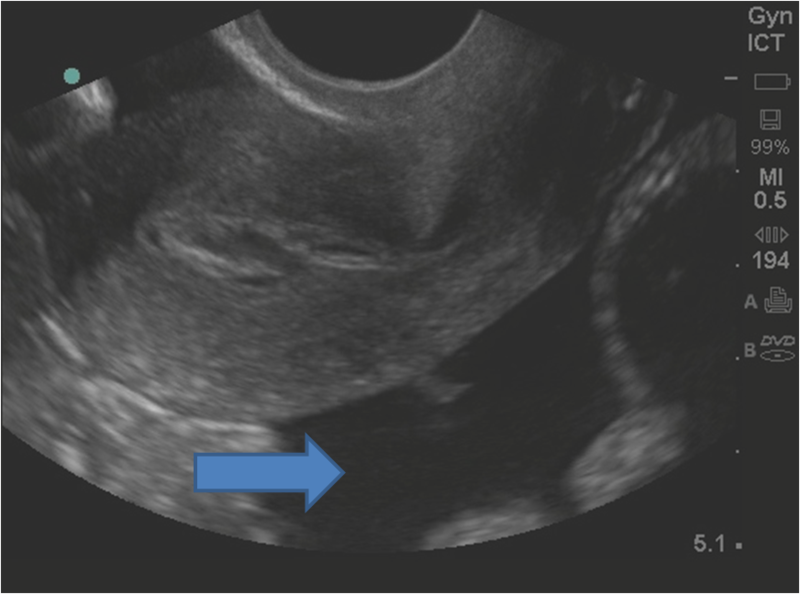 Here is a picture of an ultrasound showing some free fluid in the pelvis. The arrow points to the free fluid. Presumably this fluid stated in the uterus and got squeezed through the tubes and ended up in the pelvis. However seeing water outside the tubes does not necessarily mean the tubes are in good shape. First of all, one can’t see much detail of the patterns of water flow; the flow can’t be seen as clearly as the dye on an x-ray. We may be able to see if there is water present but we can’t see how it got there. Let’s say, for example, that only one tube is open. This is easy to see on HSG, but on saline sonogram, you cannot tell if one or two tubes are open because you usually can’t see the water flowing from each tube. Here is an HSG showing open tubes. In the second picture I places lines to show you the approximate place there the tubes ends and there the free flow of dye out the tubes starts. This is much better visualized on the HSG; you can see each tube and the flow of dye directly. In the case of a hydrosalpinx, the end of the tube can fill with fluid, and although the doctor should be able to tell the difference between and hydrosalpinx and an open tube, sometimes the distinction is difficult. 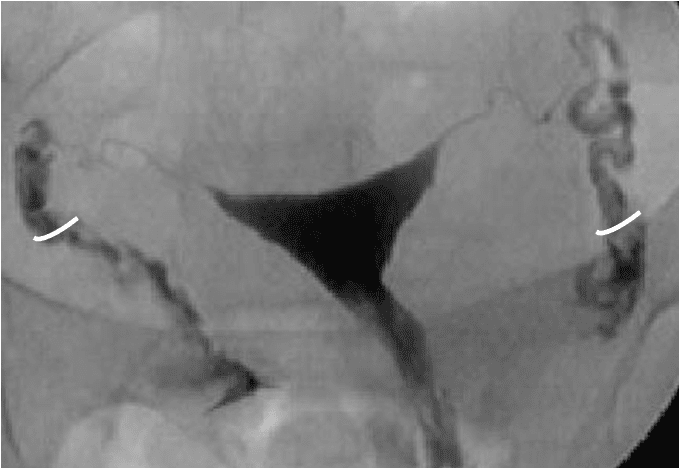 Here is an HSG of a hydrosalpinx. The arrow points to the blocked tube. You probably noticed that some HSGs show the dye in white and some in black. It just depends on the preference of the physician, they can be printed with either way. A hydrosalpinx is usually very easy to see on HSG, possible but more difficult to see on saline sonogram. The point is that this hydro, using a saline sonogram, may have shown up as a little free fluid, and someone may have been told her tubes were indeed open. Severe tubal disease like this may be present even though there is some “free fluid” seen in the pelvis. At the start of this blog I spoke of the biggest mistake docotrs make when interpreting the sonohysterogram. No fluid in the pelvis does not necessarily mean the tubes are blocked, and IVF may not be the next step after “failing” a saline sonogram. Do not use saline-sono tube tests to make decisions about IVF. A saline sonogram is not an adequate test to proclaim the openness of your tubes. If you want important information about your tubes, a hystersalpingogram is the only way, with very few exceptions, as in the case of a very obvious hydro. 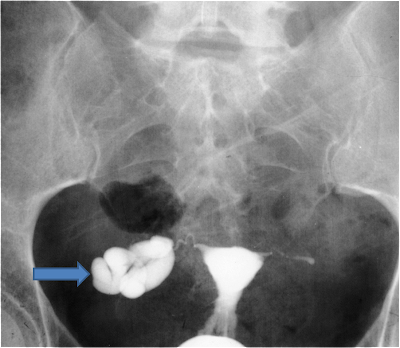 Sometimes there is no free fluid seen outside the uterus, but maybe this is because the catheter was not positioned properly, maybe the fluid just backed out the cervix instead of going upward, or maybe there was tubal spasm. In any event, if you were told no free fluid means IVF, talk to your doctor about having an HSG. That’s it for now, thanks for reading, and don’t forget to read disclaimer 5/17/06. Papaioanou S, Bourdrez P, Varma R, Afnan M, Mol BW, Coomaraswamy A. Tubal evaluation in the investigation of subfertility: a structured comparison of tests. BJOG 2004; 111(12):1313-21. Swart P, Mol BW, van der Veen F, van Beurden M, Redekop WK, Bossuyt PM. The accuracy of hysterosalpingography in the diagnosis of tubal pathology: a meta-analysis. Fertil Steril. 1995 Sep;64(3):486-91. This entry was posted on Sunday, October 10th, 2010 at 6:24 pm and is filed under Uncategorized. You can follow any responses to this entry through the RSS 2.0 feed. You can leave a response, or trackback from your own site.